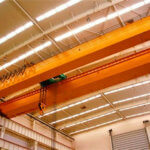 Right here in this post, Ellsen overhead bridge crane factory provides you latest crane news in the world, wish it will be helpful for you and enjoy it. China’s high-speed rail has developed rapidly. In order to improve the demand for railway lifting and rescue technology, China Railway Corporation launched the R & D project of rescue cranes in 2013, and so far, the project has entered the final stage.While the rescue crane, forthcoming in April 15th, by the railway rescue crane manufacturer has entered the stage of grasping test, in order to meet the rapid development of China’s high-speed railway, improve the railway crane rescue technology demand of the “big guy” upcoming. The development of railway rescue crane can not only achieve the goal of high-speed rail rescue application, safety, high efficiency and intelligent control but also fill the gap between China and foreign countries to adapt to our railway rescue cranes.With the increase in the mileage of high-speed railway and the development of rescue technology, the crane model will make an important contribution to China’s railway rescue. It is understood that the high-speed rail rescue rail cranes are mainly used for high-speed rail EMU vehicle accident rescue work, suitable for high-speed rail lines, bridges, tunnels, curves, ramps and catenary under various conditions of rescue operations.It has the capacity of 125 telescopic cranes, and can also be used for large cargo handling and heavy equipment installation. It has the characteristics of strong adaptability, flexible operation, and high efficiency. The railway rescue rail crane adopts bridge load sharing technology and leg load intelligent control technology to solve the problem of high-speed railway line and bridge bearing capacity limitation.The new 4E axle welding bogie technology has been adopted to solve the problem that the high-speed rail 120km/h return does not limit speed through all kinds of span bridge problems. The technology of double rotary is adopted to solve the problem that the two-way railway rescue does not affect the normal traffic of the adjacent line. By using the curve leveling technology, the high-speed rail vehicle can be able to walk normally under the condition of the high 175mm of the curve and the outer rail.The hoisting capacity of the crane is improved by using the circular arc hanging arm and the long stroke telescopic heavy iron technology.The use of the world’s leading intelligent security control system ensures the safety and reliability of the crane’s rescue in railway bridges. At present, all kinds of test work of high-speed railway rescue crane have been completed.The railway rescue crane meets the rescue needs of the double line bridge rescue, the single line bridge rescue, the tunnel rescue, the curve rescue, the slope rescue and other conditions. 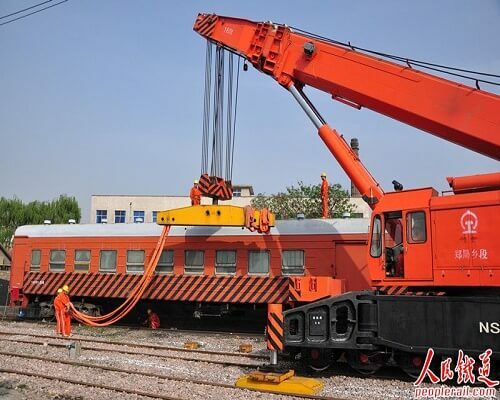 According to the technical personnel, the new railway rescue crane can resume all types of motor car body along the track, the maximum lifting capacity is 125 tons, the return axle load is 18.5 tons, and the return speed is 120 kilometers per hour.It is expected that the goal of high-speed rail rescue application, safety, efficiency and intelligent control can be achieved after being put into operation, and it will fill the gap for domestic high-speed rail rescue cranes. The development of railway rescue crane can not only achieve the goal of high-speed rail rescue application, safety, high efficiency and intelligent control, but also fill the gap between China and foreign countries to adapt to our railway rescue cranes.With the increase in the mileage of high-speed railway and the development of rescue technology, the crane model will make an important contribution to China’s railway rescue.